Surgery News & Resources- So. Shore Orthopedics' PA specializes in Sports Med..
Renee Blaha (pictured left), a certified physician assistant and certified athletic trainer, has joined the staff of South Shore Orthopedics. As a physician assistant, Blaha can conduct exams, diagnose and treat illnesses and injuries, order and interpret tests and prescribe medicine. Blaha will work in conjunction with the clinic's physicians, Dr. Scott Warren, Dr. John Sauer and Dr. Clinton Moen as well as Troy Naftzger, PA-C. The clinic specializes in general orthopedic surgery, sports medicine, total joint replacement, emergency orthopedics, hand surgery and arthroscopic surgery. "I feel the most important part of my work is developing a good relationship with my patients. In fact, it's more than a relationship, it's a partnership," said Blaha. She hopes to work with area high school and college athletes, "My goal is to help them return back to athletics as quickly and safely as possible." 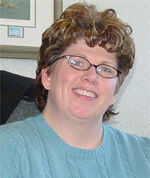 "We are pleased to have Renee on our staff. She has a background in Sports Medicine and osteoporosis care. Her greatest strength is her ability to counsel patients on regaining and maintaining their good health," said Dr. Scott Warren, orthopedic surgeon with South Shore Orthopedics. "I spend the time it takes to educate my patients to ensure they can make well-informed decisions regarding their treatment. I want every patient to understand what their problem is and what their options are." said Blaha. She explains as a physician assistant, she works in conjunction with the orthopedic surgeons to provide orthopedic care. Blaha earned her bachelors degree in Physician Assistant studies from the University of South Dakota School of Medicine. She has an undergraduate degree from Bemidji State University. She worked as a certified physician's assistant and athletic trainer at the Center for Neurosciences, Orthopedics and Spine PC in South Dakota, as well as with Miller Orthopedic Affiliates in Iowa. She is a member of the American Academy of Physician Assistants and the Physician Assistants in Orthopedic Surgery. She also is a certified clinical bone densitometrist. Blaha spends her free time jogging, hiking, playing softball, traveling and reading. To make an appointment with Renee Blaha, contact South Shore Orthopedics, located on the ground level of Memorial Medical Center in suite 1 or call, 682-8183. Ms. Blaha is also available for speaking engagements regarding orthopedic and sports medicine topics.